I've applied what was suggested in this post https://www.jotform.com/answers/333310. It works for email and pdf but it loses the formatting of the text in preview mode. I checked your form 73613159595364 but I don't see any text field anywhere. Can you please confirm I'm on the correct form, and that a text field actually exists? the form number is correct. 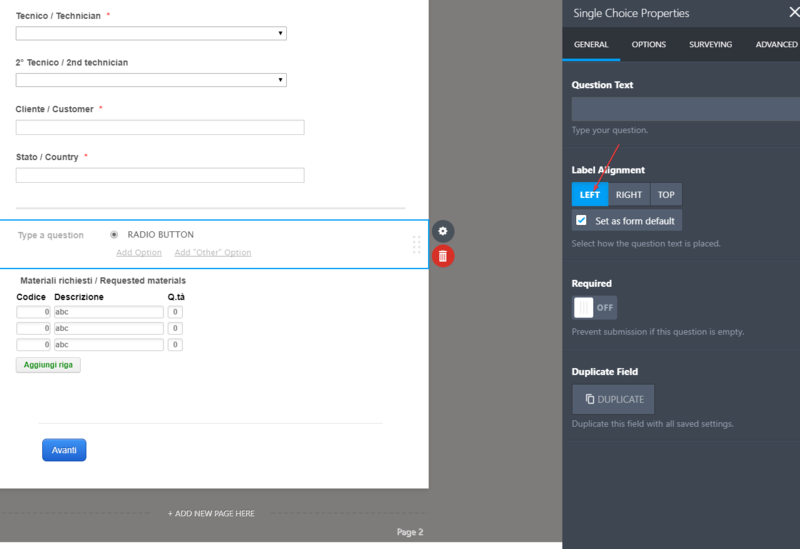 The problem is not about a text field but a radio button. I have removed the "hide" option and changed the radio button text to "RADIO BUTTON" and color to RED, so it's simpler to find. You can left align it in the Properties field. Thanks, this solved my alignment problem. But what about my original question "It works for email and pdf but it loses the formatting of the text in preview mode." ? I realized that it loses formatting also in the pdf. Can you please be more specific? 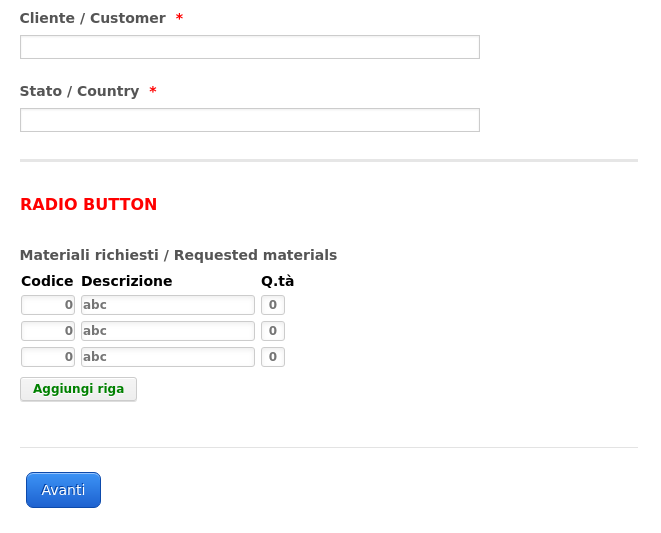 How do you want the radio button to look? 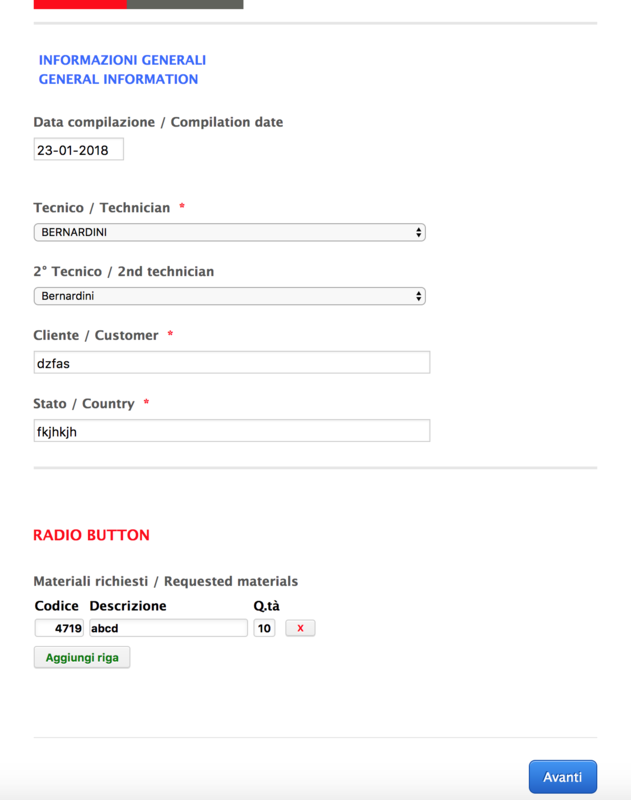 The radio button is ok, the problem is about the formatting of the text of the radio button. In my form is bold and red, but in preview mode and in the pdf it comes out normal and black. Try adding !important to each line. Unfortunately it does not work, neither for the preview nor for the pdf. Kindly try injecting the CSS code below. Change the "font-weight: " to the highlighted value above. Also in the cloned version the preview does not shows the right format. Could you please attach a screenshot on what you are seeing in the Preview ? this way we can have it check and test further and also will let us know if we completely understand your issue. You may check this guide on how to attach a screenshot on your reply. 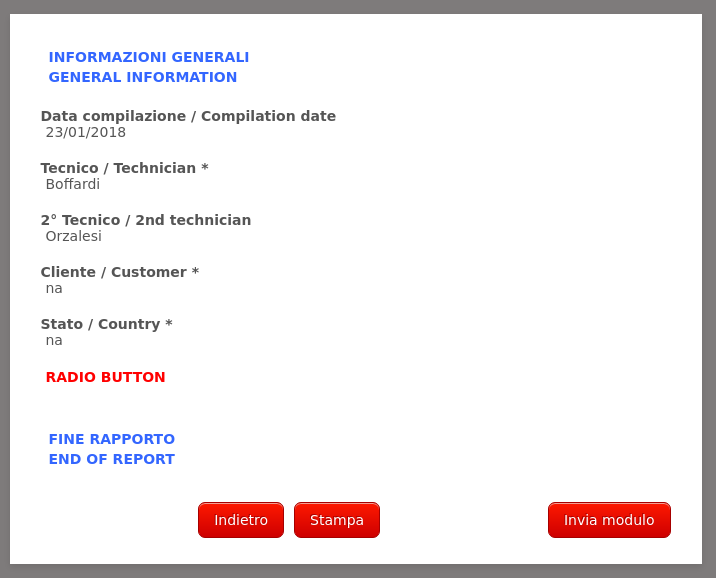 RADIO BUTTON text should be bold and red. Can you please clear your browser's cache. I tested out your form and the "Radio Button" text is bold and red. Maybe I did not say it clear enough. The text on the form is correct, the problem is in the preview, as you can see in the image I posted earlier. Please, let me know if there is a solution, at least I decide how to proceed. 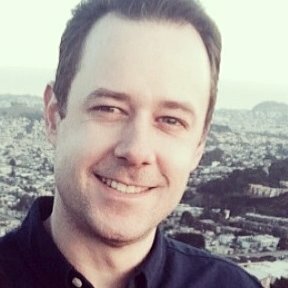 One field is using a Text field and the other is using a Single Choice field. Try using a text field to display the text and editing the coloring of the text in the text field. This should also resolve the issue of the button text not being aligned to the left. 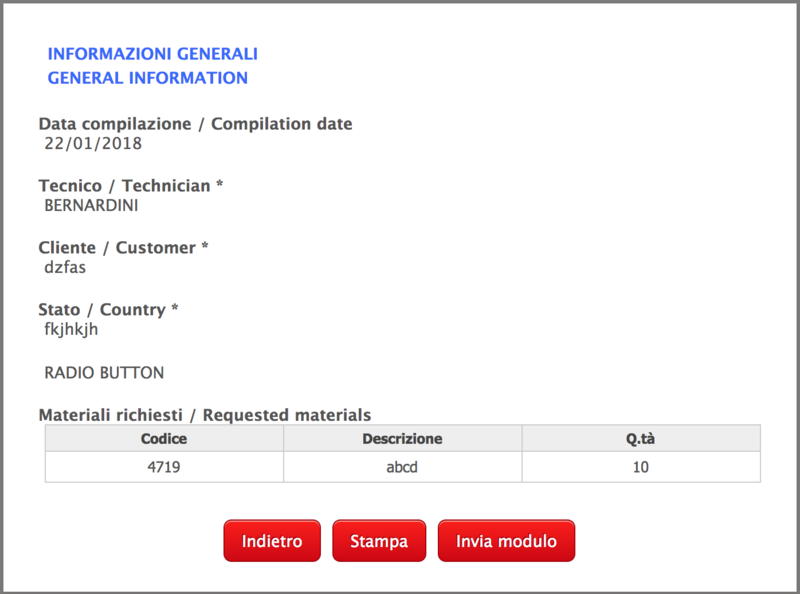 If a radio button is used, the preview before submit will display the data as label aligned left then answers slightly indented. The label is bold, answer is not. The text would also match the rest of the questions/answers in the preview. So in the case of your form, it would be an empty label, then RADIO BUTTON indented. Sorry if I insist, but all the answers given do not consider the preview mode. This is where the problem presents itself: the text of the radio button is not bold and red. Have a look at the images below (on the left the form, on the right the preview mode). By preview you mean the preview before submit widget right?